An official source said that the army units on Monday restored security and stability to Sadad town in Homs countryside, eliminating the terrorists’ latest gatherings there. An official source told SANA that a big number of terrorists were killed and their weapons and ammunition were destroyed in addition to dismantling dozens of different weighs explosive devices which were planted by the terrorists in the streets and neighborhoods of the town. The source added that an army unit dismantled a booby-trapped car parking in al-Daleh roundabout in the town. ” Pursuing terrorists in the farms surrounding Sadad is still continued” the source said. SANA reporter said that the armed terrorist groups tampered with and destroyed Mar Tudors Church and the citizens’ properties and houses, and the public facilities and infrastructure in Sadad. Earlier, an official source added that army units destroyed cars loaded with weapons and ammunition on al-Hafar-Sadad – Hawarin and Hawarin-al-Hadath roads while trying to reach Sadad town and Hawarin village to help the armed terrorist groups that suffered heavy losses by the army units. 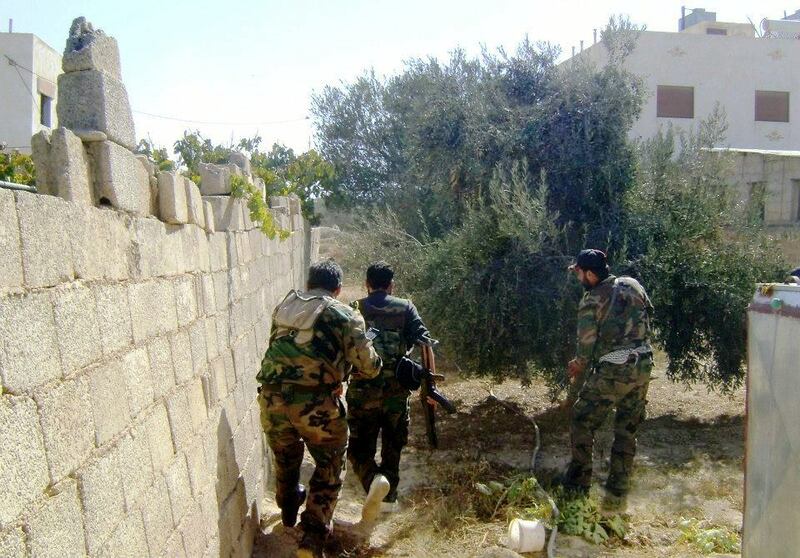 An army unit carried out an operation against armed terrorist groups’ dens near al-Amal Hospital and to the north of Dawar al-Shawaya in Yabroud city in Damascus Countryside. A military source told SANA that many terrorists were killed during the operation including Ahmad Anka, a terrorist group leader. The source added that army units also destroyed several cars loaded with weapons and ammunition to the west of Jaba’adin and to the north of al-Nabek, killing or injuring all the terrorists. Army units clashed with terrorists who tried to attack residents of Bustan al-Qaser and al-Suleimaniyeh, as they also killed members of armed terrorist groups in several towns and villages in Aleppo. A military source said that an army unit killed many terrorists during their infiltration attempt into al-Suleimaniyeh neighborhood from the side of al-Sakhour and al-Sheikh Khuder in a bid of attacking its residents, adding that the unit destroyed the terrorists’ machineguns and ammunition. The source pointed out that most of an armed terrorist group’s members who attempted to infiltrate into Bustan al-Qaser from several narrow bystreets were killed, while others fled, leaving their weapons and ammunition. Also, army units destroyed cars loaded with weapons, den and terrorists’ gatherings in the surrounding area of Aleppo Central Jail, the surrounding area of al-Bab city, near al-Kindi Hospital, al-Jdeideh, Kweiris, Arbid and Rasm al-Abboud areas and al-Castillo-Kafarhamra – Dahrat Abed Rabbo Road, the source added. Army units clashed with armed terrorist groups in several town and villages in Idleb countryside, and killed many terrorists during their attempt of attacking Bee Center in al-Sqeilbiyeh city in Hama countryside. A military source said that an army unit eliminated armed terrorist groups in the surrounding area of Abu al-Duhour Airport in Idleb countryside, and destroyed their cars loaded with weapons and ammunition. The source added that big numbers of terrorists were killed, as many others were injured and their weapons were destroyed in al-Majas, Om Jrein, Qare’ al-Ghazal, Tal al-Daman villages and the area surrounding Tal Salmo. In Hama countryside, army units foiled an armed terrorist group’s infiltration attempt into Bee Center in al-Sqeilbiyeh City in al-Ghab area, killing most of its members. This entry was posted in +AAArchive, al-Qaeda, foreign-backed insurgency, foreign-backed terrorists, Free Syrian Army, Jabhat al-Nusra, Syrian Arab Army, Syrian Heroes, Terrorists, Terrorists killed and tagged al-Qaeda, foreign mercenaries, foreign-backed insurgency, foreign-backed terrorists, Jabhat al-Nusra, Syrian Arab Army, Syrian Army, Terrorist killed, Terrorists, War Against Terrorism, War Criminals, War on Syria by syrianetwork. Bookmark the permalink.